Art and technique at Heroku’s Waza conference. Click through for a larger image. Clockwise, from top left: Musicians playing as attendees entered; drummer and gong play as an artist uses a broom-sized paintbrush to paint Waza on the banner; barista brewing a custom Mexican blend; quilting; Legos. Two weeks ago, I was at Heroku’s annual day-long developer event, Waza, which means art and technique in Japanese. 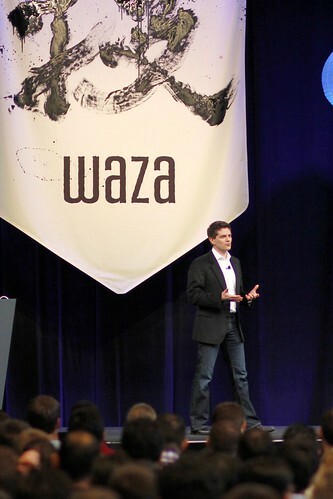 Waza often gains comparisons to our own Monktoberfest and Monki Gras conferences in flavor, to give another frame of reference, although it’s quite a bit larger as this year’s conference drew ~1,000 people whereas RedMonk conferences tend to instead optimize for intimacy. 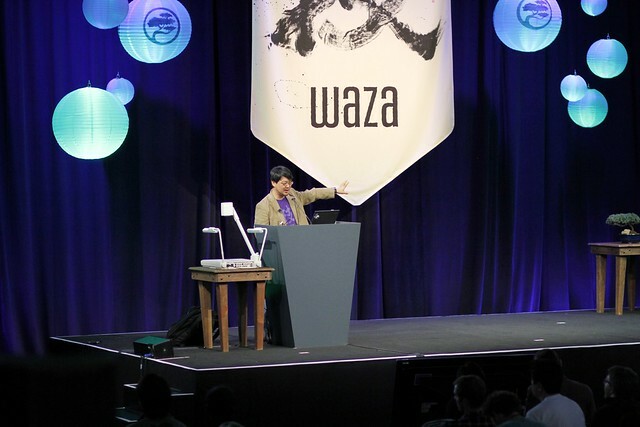 Heroku COO Oren Teich opened up the day by describing that Waza, in Japanese, meant art and technique — exactly the way they wanted developers to see the world. He of course alluded to the RapGenius issue by talking about Heroku’s need to improve transparency. Heroku COO Orren Teich during his opening address. Orren followed up by introducing Michael Lopp (Rands), who gave the only true keynote of the conference. It was a nice talk on stable vs volatile people (along the lines of my post comparing tech personalities to commandos, infantry, and police). After that was lunch, followed by a split into four tracks (three talks plus an Arduino track). Late in the afternoon some Matz guy gave a talk. Apparently he works for Heroku and created this language called Ruby (anyone heard of it? ), and he spoke about its 2.0 release. The language seems to be doing pretty well. Matz (Yukihiro Matsumoto), creator of Ruby and Heroku employee. Where did they do a great job? Everything around the talks themselves was all over the map, in a good way. The day opened with Japanese music as attendees walked in (with badge pick-up starting at a very [perhaps overly?] developer-friendly 10am). Then the conference truly started at 11am with a drum ceremony where an artist painted the Waza symbol onto a huge banner with a mop-like brush. They had quilting, book-binding, Arduinos, origami, and craft coffee. On the downside, the coffee was not served for two, as I’d hoped based on a Monki Gras talk. The content was solid and often ranged outside the realm of code alone, although as a software-centric conference, there were a number of talks that did dive into the code. All the talk videos are online, which is a great decision on Heroku’s part to broaden the audience for their outreach and philosophy. The agenda made it fairly difficult to figure out what the talks were about, however, as it focused on the speakers rather than the content, so I tended to wander through multiple talks when looking for the “right” one. The analyst meetings were run in a novel, and very fun to me, way. Rather than trotting around between a series of tables or rooms, a group of us simply sat down at a long table and had a conversation for a couple of hours. People occasionally joined or left, and the conversation generally centered around specific people at specific times, but it felt much more authentic to me than your usual orchestrated meeting schedule. Logistics were a real issue. While the idea of an open space with an overlap between speakers and informal conversations seems to have potential to draw more attendees into the talks, the implementation had some complications when things went the other way around. With three “rooms” (main track in the center, and a couple of curtained-off spaces), sound from the main track often interfered with the side tracks, and the hallway track generally interfered with everything. Logistics interfered again at lunchtime, where there were perhaps five trucks for 1000 people. No wonder it took 45 minutes or longer to get through the lines! They needed easily double the capacity to make things work well. This is a really hard problem to nail, particularly in a new venue, but it’s something to keep in mind for all conference planners. The content was interesting but not inspirational. As someone who goes to a lot of conferences (according to TripIt, I was on the road around 115 days last year), I’m quickly becoming experienced, and even jaded, about conferences. My take on the content was that it would likely be new to developers who hadn’t spent much time thinking beyond the code to the social side of software engineering, like the solo webapp creator. Others who may have had experience in open-source development, as an example, likely had to dig deeper for something new — sticking to the hallway track, the creative arts, perhaps the Arduino area. Waza was a fun show. The attendees were great and very enthusiastic about Heroku and the conference, which makes all the difference in the world. Although some logistical issues interfered, they didn’t seriously detract from the overall feel of the day. Having the artists, the excellent baristas, and the other craftspeople aroun did a good job of setting the stage for the day and maintaining the right kind of atmosphere throughout and ensured there wouldn’t be a dull moment. Disclosure: Heroku and its parent Salesforce.com are clients and covered T&E.